Not all of these will be applicable to every deployment, but the tasks covered are worth knowing how to do. Using Profile Manager and migrating the actual managed preferences from existing tools into Profile Manager I saved for last (after all, you need your infrastructure in place to do this). Here, I’m just going to look at Workgroup Manager and manually move each preference from Workgroup Manager into Profile Manager. To get started, I usually like to open a screen with Profile Manager and another with Workgroup Manager, lining them up side by side. This allows me to quickly and easily cut-copy-paste between the two. I also like to be very orderly, choosing to step through the Workgroup Manager list in order, moving each option I have selected in Workgroup Manager over to Profile Manager. I usually start with user groups, then do computer groups, then look for specific computers I may have applied policies to and finally specific users that might have policies attached to them. The screens, by default, for my initial user groups, would look as follows (where there are some managed preferences in Workgroup Manager but not yet in Profile Manager): Right off the bat, if you’re going in order of those displayed in the Workgroup Manager GUI, you’ll notice that there aren’t any listed for Applications in Profile Manager. This is because Applications, Media Access and System Preferences are located in the Restrictions payload for Mac OS X in Profile Manager. Click on it and click on Configure to enable the payload. Rather than go through each preference and each setting of each preference, suffice it to say that most are there. In some cases, you won’t see one, such as disabling Front Row, but you’ll have a cool new one, such as disabling AirDrop in its place. The workflow is a little different in some places. For example, in Workgroup Manager, you can run the Workgroup Manager application on a computer that is not the server and easily add applications and printers to the preference that are not actually installed on the server. Annoyingly, because Profile Manager is a web application, you need to put the .app bundles and install the printers on the server in order to push them out through Profile Manager. While this caused some initial heartache, I just ended up taking the app bundle, copying it to the server temporarily and then adding it, whether the application was installed or not. Printers are easy enough to install on servers as well. The Classic managed preference is pretty much no longer needed, so it has been removed. Finder and Universal Access are also gone in Profile Manager. But this doesn’t mean you can’t manage them. Just as you could manage custom preferences using the Details tab, you can manage custom preferences using the Custom Settings option as well. Simply open the Custom Settings payload and then use the plus sign to create each preference domain that you would like to manually configure. Click on the Upload File… button to import a property list manually and then delete the items that you don’t want getting pushed to clients (seems similar to how you did things in Managed Preferences, right?). Another managed setting that is missing from Profile Manager is Software Update. 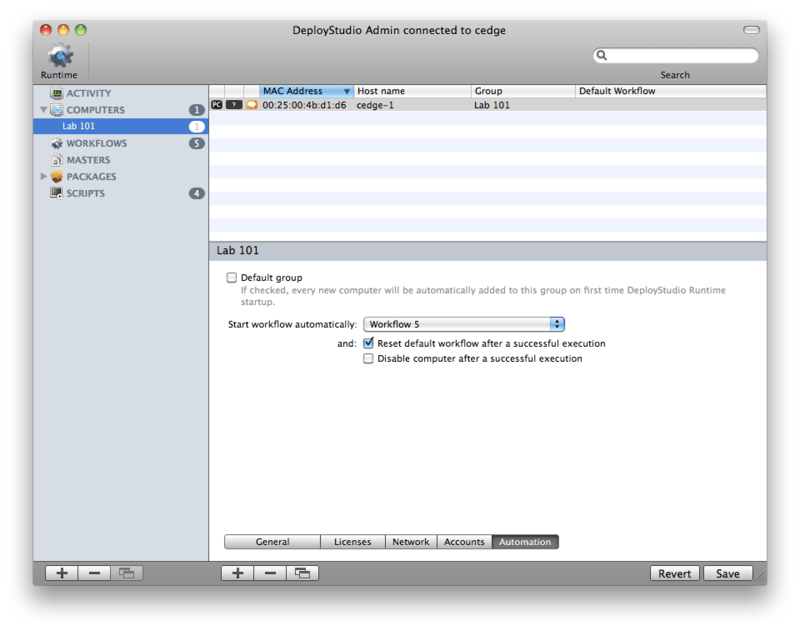 Here, we’ll add it by looking at the details in Workgroup Manager and then duplicating the settings in Profile Manager. You can do this for any of the missing objects as well as any third party software. For example, we’ll click the plus sign (“+”) to add a preference and then enter com.microsoft.autoupdate2 into the Preference Domain field and HowToCheck as a key (String) with a value of Manual. This would disable Microsoft’s automatic updates so we can manage them through our patch management solution. 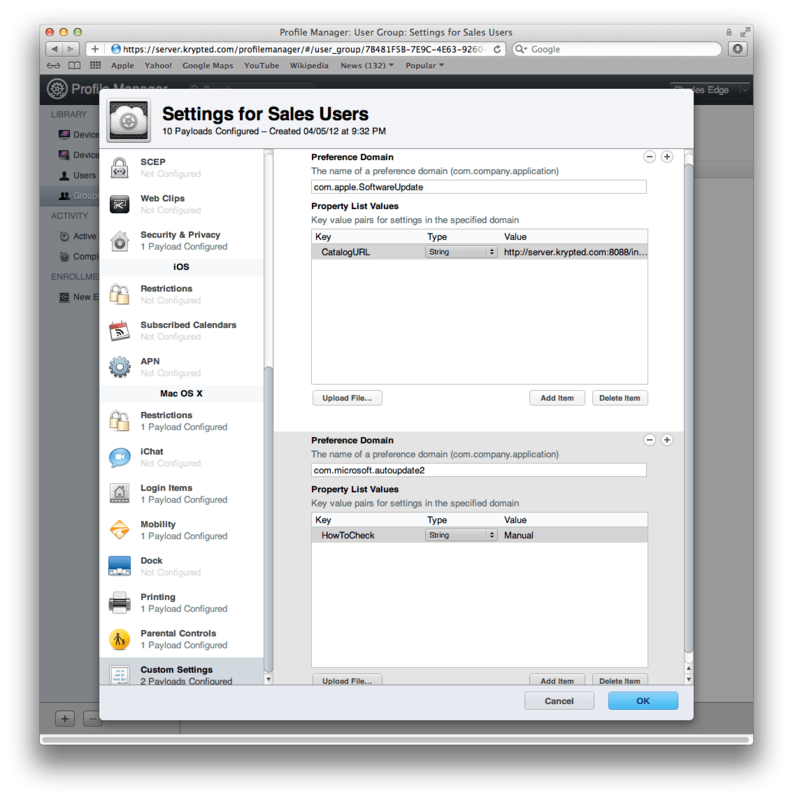 The biggest change in moving to profiles and Profile Manager is the fact that you no longer have the option to manage settings using the Once Often and Always settings we grew to love in Managed Preferences. There are trade-offs. Such as the fact that you can have many of the settings instantly updated on clients, wipe devices, etc. The way you remove an Always profile is to remove the payload. For those still needing Once and Often, you can stick with Managed Preferences for a bit longer, but you might want to start considering ways of not accessing those manifests. In exchange you can centrally push out SSIDs for wireless networks, automatically configure clients for Exchange (not the password) if you’re using Mail, iCal and Address Book, deploy certificates, configure password policies and even perform some fairly delicate 802.1x foo, without touching a script. There’s definitely going to be some stir over the fact that, as with iOS, centralized management via Profile Manager is an opt-in experience. Users can remove their enrollment profile as they wish. Of course, if you’ve hidden the Profiles System Preference pane then they might have a problem getting rid of it, but get rid of it they may. Therefore, it’s worth considering a few strategies for dealing with that. One I like is automatically unbinding clients that are not listed in the devices table of the Profile Manager database. Another is to send ninjas to their house so they may be pelted with shurikens (1d6 of damage each, btw, so don’t throw too many). It’s also worth noting that data doesn’t always disappear with profiles in Mac OS X the same way it does with iOS and that profiles are a Lion and above experience, not working with Snow Leopard and older operating systems. Whichever strategy you take with migrating to profiles, it’s worth starting to think about and test this new type of user experience now. Of course, if you have a 3rd party patch management tool, such as the Casper Suite, that allows for local managed preferences, you’re likely better off deploying policies through there. If not, then don’t feel rushed, as Managed Preferences are still how Profiles deploy their payloads to clients. However, the means with which you have been deploying Managed Preferences may be changing over the next few years, so it’s a good idea to start looking at this now in order to be prepared for future releases. Once you have done so, open System Preferences and then click on the DeployStudio preference to restart the DeployStudio Server. You can also restart the DeployStudio Server using launchctl with the com.deploystudio.server daemon. Once restarted, your new computer (or computers if you ran both examples) should be listed in DeployStudio. Happy scripting! DeployStudio has the ability to import a csv file that is populated with the MAC address and a few specific settings. This allows you to prepopulate the database with the names that you want each machine to have. If you purchase a lot of machines from Apple then you can get a list of MAC addresses, or, you can use a bar code scanner to scan them as you’re unboxing. If you have a list of MAC addresses (en0), then you will need to format them in a very specific manner. Here, I have included a sample csv file with the data that goes into each field, which I have name DSImporter.csv. Once you paste the data that you’d like into the csv, provide the computer names (these can be pasted or compiled using formulas). Once done, save and then open Deploy Studio Admin. From here, click on Computers and then (as you would with iTunes) click on the plus sign (+) and create a new computer list (this step is optional, but I prefer to always import into computer lists, just in case something goes wrong, especially with my first import). Once you have created the computer list, you should see a screen similar to the following. 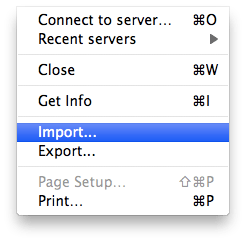 Next, click on the Server menu and select Import. Now browse to your csv file and then click on the Import button. When the import is complete you will see a screen informing you as such. Click on the Done button to complete the process. You will then see your computers listed in the database and should see the names that you assigned them listed as well. You can now set a workflow item in DeployStudio for Reconfigure system with computers database content (shown below). This will set the name (and any other fields you decided to use) from the spreadsheet that you imported into the computer list. Once you have your computers in a group, you can also set a default workflow for them for their first time imaging, by clicking on the name of the group and then clicking on the Automation tab at the bottom as you can see below. Here, you will set the workflow to run and optionally set the computer to not have a default workflow moving forward or just be disabled so users can’t accidentally reimage their computers later. If you don’t have the MAC addresses for your computers ahead of time, you can use the Hostname option instead. This will enable you to enter the computer name that you would like to use moving forward into the DeployStudio Runtime at imaging and then have it stored in the DeployStudio database, where it can be used to build future workflows or even be exported and imported into the Open Directory computers. Overall, the computers and groups in DeployStudio Admin can be used to design more and more complex imaging sequences and to provide much of the scripting logic that a number of organizations need. Beyond that, JAMF, FileWave and a few other solutions offer even more logic and even more features or a little shell scripting can take you a really long way. Masters – Images currently located in the repository, where all of the images are stored. In order to populate the Masters list use the DeployStudio Runtime. 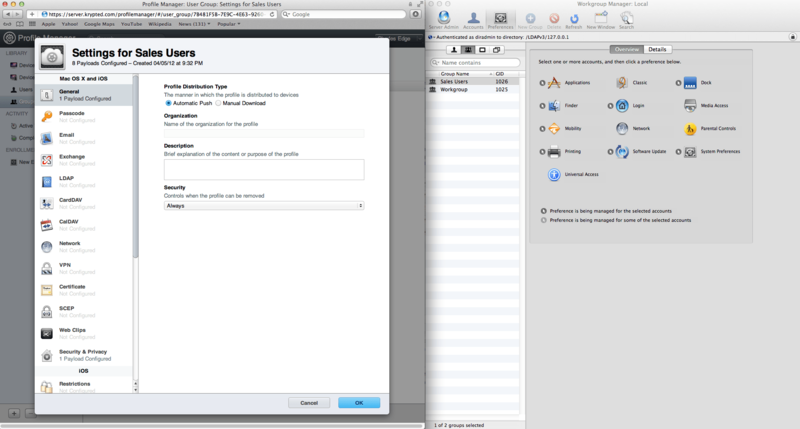 The DeployStudio Runtime is used to play workflows. The workflows that can be played could include a workflow to capture an image or one to put one onto your desktops, as would be typical for mass deployment. 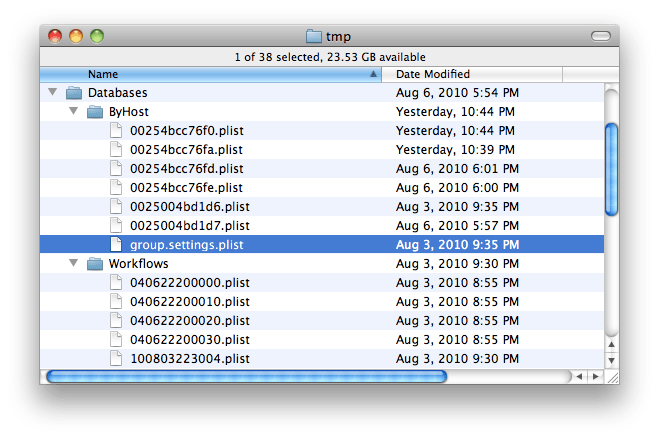 You can run the DeployStudio Runtime manually from Mac OS X as well, which allows you to test the workflows that you have built to restore (play) images onto a local Firewire or USB drive. Let’s look at using the runtime to create a master (base image) from a source volume. Open the DeployStudio Runtime and authenticate into your server. Then click on the Create a master from a volume button and click on the Play button. Next, provide the specifics for creating the image. Select a source hard drive to base our image on. Place a name for the image in the Image Name: field. Set your image Type to Read Only for now and then enter the format for the file system of the image (for OS X machines, this will pretty much always be HFS+). Once you’re ready, click on the Play button to begin building an image of the hard drive. DeployStudio will automatically clean out the unique information for the machine (ie – LocalKDC) and build the image when played.